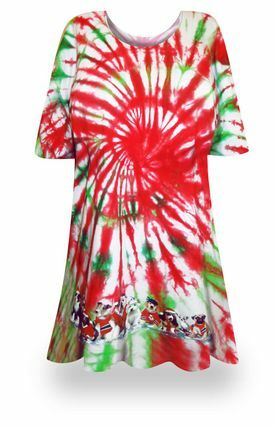 Peppermint Swirl Supersize Extra Long Tie Dye T-Shirts. Kick off the Christmas season right with this fabulous Tie Dye shirt. Ten of the most adorable Christmas puppies of every breed adorn the bottom of this shirt. Ink colors are bright red and Christmas green.